14k gold ring. Beautifully fashioned and finished, this elegant ring is perfect for any occasion. 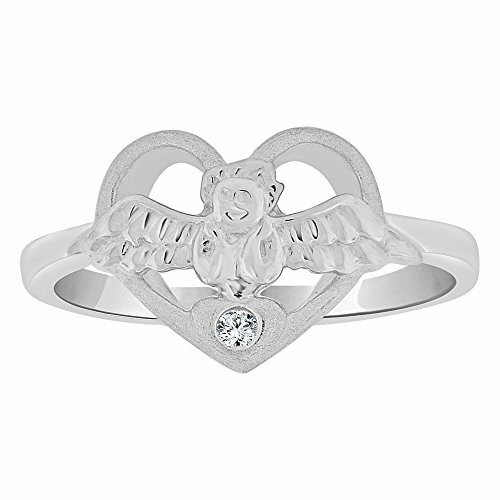 Long been a guardian for children, angels symbolize purity and protection for any one bearing the symbol. Adorned with a single synthetic cubic zirconia crystal. A perfect child ring. It also is a great pinky ring for adults and teens. Genuine 14k gold. A gift box is included with purchase. Stylish and beautiful on the finger with sparkly brilliant cut synthetic cubic zirconia crystal. Angel design is modern and elegant. The small size is perfect for kids. Also makes a wonderful pinky ring for grownups. If you have any questions about this product by GiveMeGold, contact us by completing and submitting the form below. If you are looking for a specif part number, please include it with your message.